U.S. has been target of domestic/international terrorism due its own policies. Charlottesville, Paris,London and now Barcelona. Sad days when cars, trucks, vans became weapons of mass destruction. The hate and violence continues ….. Surely there IS enough love to go around! Like many Muslims and non-Muslims alike, I have breathed a sigh of relief, seeing the latest retreats, defeats and setbacks of the so-called Islamic State (IS) both in Iraq and Syria. The IS, as a group may well soon become part of history, but the idea encapsulated by the IS is likely to live on and on and on, constantly assuming different forms and names. Having said that, I don’t imply in any way any modicum of support or sympathy for the regimes IS has been fighting in Iraq and Syria. The Iraqi regime, created by the US in 2004 in order to plunge the region in endless violence and turbulence, is shamelessly sectarian. It torments, even murders, its own citizens because they have the |”wrong” religious affiliation. And it has effectively handed Iraq over to Iran on a silver platter. As to the Syrian regime, it is decidedly nefarious. No person with any iota of rectitude would give that regime the benefit of the doubt, if indeed there were any doubts as to the nefariousness of that regime. What else can be said of a regime that has destroyed its own country, virtually completely, murdered close to half a million of its own citizens, even by using deadly chemical weapons, and forced 11-14 million Syrians (70% of the population) out of their homes. And the reason? To extend its lifespan in power a few more years against the will of the overwhelming majority of the Syrian people. Indeed, in the first few months into the Syrian uprising, the thuggish regime of Bashar al-Asad instructed its Gestapo-like Shabbiha thugs to scrawl the following slogan on walls all over Syria: Imma al Asad…Aww Nihreq al Balad ( either Asad stays on, or we will burn down the country.) Well. Thanks to Russia, Iran, Hizbullah as well as western treachery and betrayal of the Syrian people, Asad has made good on his threats. He has remained in power, but Syria has been nearly completely destroyed. I most sincerely believe that it is only the naïve and the hopelessly stupid that are celebrating the demise of the IS. The IS, as a group may well soon become part of history, but the idea encapsulated by the IS is likely to live on and on and on, constantly assuming different forms and names. This is because IS and other extreme Muslim groups especially in the Middle East are, whether we like it or not, the legitimate daughters of the illegitimate tyrannical Arab regimes and police states. Don’t you believe anyone who would tell you otherwise? Now, we all know that these manifestly terrorist regimes owe their very existence and survival to foreign powers such as the United States, a superpower which we all know is at Israel’s beck and call. .
A few years ago, the Egyptian people elected a democratic government, to replace the autocratic and corrupt regime of long-time dictator Husni Mubarak. However, because the first-ever democratic regime in 7000 years of Egyptian history refused to grovel at Israel’s feet and decided to be responsible to the Egyptian people, first and foremost, not to Washington, London and Paris, the West moved hastily to topple that democratic experiment which would have changed the Arab world and eradicated terrorism. In the process, peaceful protesters were massacred en mass in full view of the capitals of Western democracy, which, instead of calling the spade a spade, chose to play the harlot. Interestingly, they continue to display their shockingly wanton political promiscuity with Muslim peoples everywhere? Have you forgotten the recent failed attempt to overthrow the Turkish democratic regime? Who backed, supported and directed that failed coup d’etat against Erdogan’s popular regime until the very end? Martians or entities from outer space? The West and the entire world must understand that it is not the ineluctable destiny of hundreds of millions of Arabs and Muslims to languish forever and ever under criminal regimes, such as the Assad of Syria and the Sissi of Egypt. In 1775, Patrick Henry, in a speech he made to the Second Virginia Convention, said: “give me liberty or give me death.” Needless to say, One doesn’t have to be a White Anglo-Saxon Protestant, or for that matter, an IS terrorist to long for freedom, justice and democracy. When will America, UK, and France understand this most axiomatic matter? And, yes, we are not children of a lesser God. 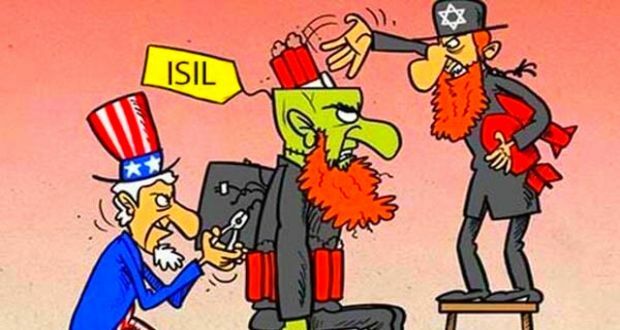 The West was responsible for the establishment of ISIS. The United States Created ISIS and continues to Assist in Funding ISIS for Secondary Gain of Maintaining Chaos in The Middle East to Protect Oil Businesses. Hezbollah leader welcomes the liberation of Mosul from ISIS, accuses the United States of creating the jihadist group. Hezbollah Secretary-General Hassan Nasrallah on Tuesday welcomed the liberation of the Iraqi city of Mosul from the Islamic State (ISIS) jihadist group, but also accused the United States of creating ISIS. “This is a victory for all Iraqis, for all the people of the region, and all those that combat terrorism, and all those who are threatened by terrorism day and night,” he said in a televised speech, according to the Lebanese Daily Star. “Freeing Mosul is a great victory for Iraq, Syria, and for all countries in the region and the world,” Nasrallah added. “There is no doubt that the victory that was announced by Iraq Prime Minister Haider al-Abadi in Mosul is a great victory. Some from the region viewed Daesh as a revolutionary movement of the Arabic Spring, welcomed it, and endorsed it,” the Hezbollah leader continued, using the Arabic acronym for ISIS. “Even the countries in the Gulf [Cooperation Council] that endorsed and supported Daesh were pleased because they were eventually threatened,” he added, while praising Iraq for having “provided all its necessary support for Baghdad” in the fight against the organization. He then claimed that the United States created ISIS and gave states in the region the green light to fund and support the group. This is not the first time that Nasrallah has claimed that the United States created ISIS. Last year, the Hezbollah leader quoted then-Republican presidential candidate Donald Trump’s statement that President Barack Obama had founded ISIS – and agreed with him. “The American Presidential candidate is saying this. What he says is based on documents and facts,” Nasrallah stated at the time. In another speech, Nasrallah claimed that the West was responsible for the establishment of ISIS. “Friends of the United States in Lebanon, friends of the United States in the region. Your friend the United States and your friend Hillary Clinton said that Saudi Arabia and other countries operating in its name are those who financed the activities of ISIS in the region, helped it, strengthened it and made it easier for it,” he said. Hezbollah, which is backed by Iran and is a supporter of Syrian President Bashar Al-Assad, has been actively involved in the fighting in the Syrian civil war, and has suffered heavy losses there. My condolences to friends, relatives of Nice attack victims . Really dunno what to say. Lack of words after this continuous carnage. At least one elected official had the guts to speak the truth! The mayor of Tel Aviv blamed the terror attack that killed four Israelis on the occupation of Palestinian lands. Hours after two gunmen opened fire in a chic shopping district, Mayor Ron Huldai said the Jewish state’s half-century rule over Palestinians was fueling the violence. “You can’t hold people in a situation of occupation and hope they’ll reach the conclusion everything is alright,” Huldai told the Jerusalem Post. The mayor was joined by Israeli Arab lawmakers in a plea for peace after the deadly attack. They said civilians “on both sides” should be removed from the conflict and denounced the possibility that Israel will embark on a retaliatory campaign of collective punishment. Even when asked about reports that West Bank Palestinians celebrated the murders, Huldai refused to take the bait. He insisted that the occupation, which he said “I know and I was a part of,” was the real culprit. “Leaders need courage to not just talk,” Huldai said. Israel’s right-wing government ministers wasted no time in lashing out at Huldai and other leftists, insisting that he was whitewashing terror. Deputy Defense minister Eli Ben-Dahan said Arabs were terrorizing Jews in the Holy Land even before the state of Israel was established, let alone when it seized the West Bank. “They are the delusional ones,” Ben-Dahan said. Joke of the Year: Saudi Arabia Forms Anti-Terrorism Coalition! Ha! Ha! Ha! 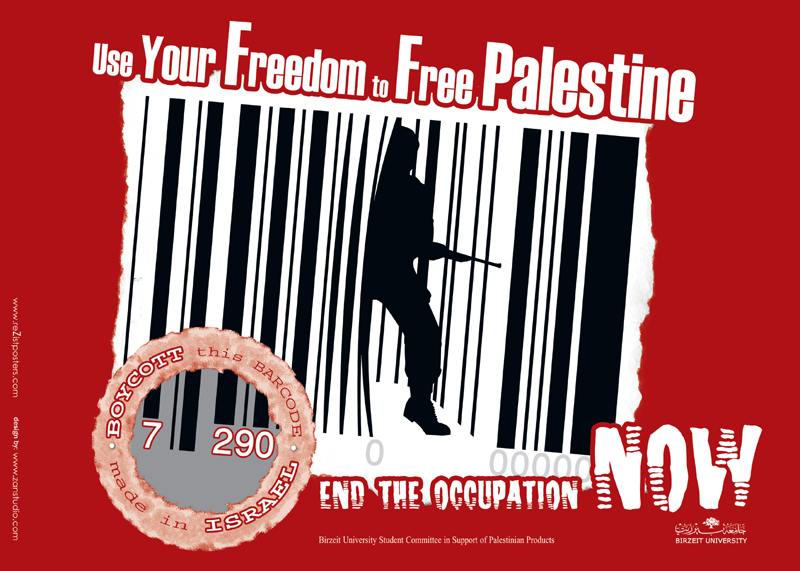 BOYCOTTS, NOT BULLETS ~~ THE TSUNAMI OF HATRED MUST END NOW! 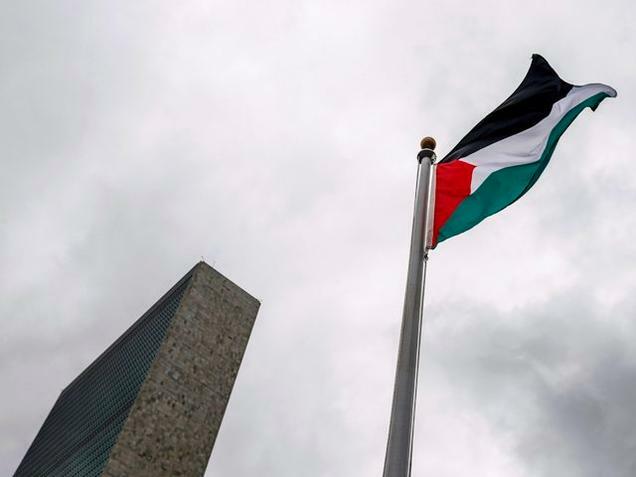 We waited decades to see the flag of Palestine raised at the United Nations Building in New York. It is a sure sign that Statehood of that Nation will soon become a fact. But, there are elements that wish to stop this process via terrorism, on both sides of the wall. This flag MUST fly FOREVER as part of the family of nations …. Don’t allow it not to. On Thursday, a Jewish father and mother of four were gunned down in their car while driving through the occupied West Bank as their children watched in horror. This is part of a never ending process of hate that only leads to more hate and more terror from both sides. Last night, two more Jewish Israelis were killed on their way to pray at the Western Wall. 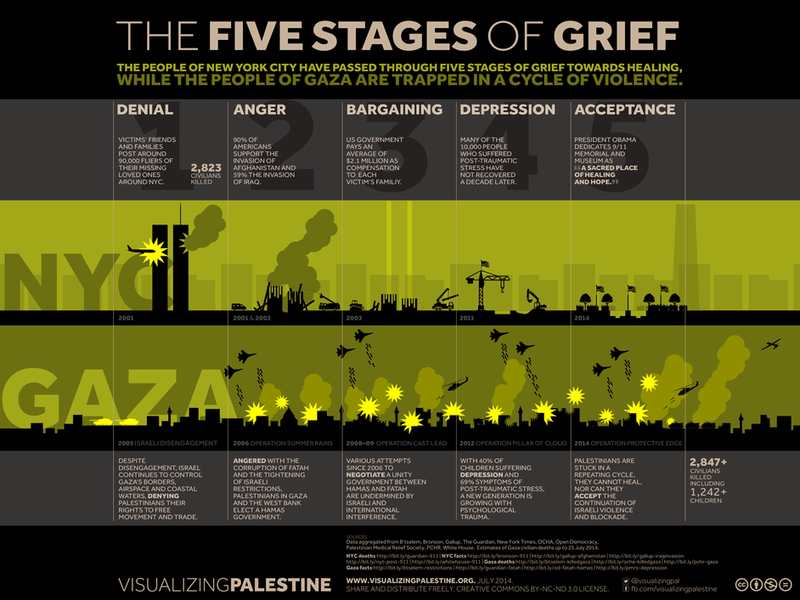 DesertPeace condemns these actions and those responsible for them. We also condemn any Palestinian Website that condones these actions as well as any zionist Website that advocates the continuation of the occupation of Palestinian territories. THE THE ONGOING TSUNAMI OF HATRED MUST END NOW! Comments Off on BOYCOTTS, NOT BULLETS ~~ THE TSUNAMI OF HATRED MUST END NOW! A group that is operating in Gaza and which says it is associated with ISIS has claimed that it killed a top Hamas commander. A group claiming to be associated with ISIS and operating in Gaza said that it killed a top Hamas commander. A group that is operating in Gaza and which says it is associated with ISIS has claimed that it killed a top Hamas commander. According to the group, which calls itself the Army of the Islamic State, Saber Siam was killed when ISIS operatives placed a bomb on his car, blowing it up with him inside. The group also sent out warnings on social media to Gaza residents to stay away from Hamas offices and buildings, lest they find themselves swept up in attacks against the group. It was not possible to verify whether the group was associated with ISIS, or whether it even actually exists. However, Israeli sources confirmed that Hamas has been conducting actions against a group of Salafist rebels it accuses of trying to take over Gaza.